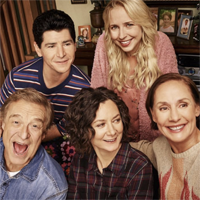 ABC has picked up a 13-episode second season of the Roseanne spinoff, up from 11 from Season 1, with the core cast of John Goodman, Laurie Metcalf, Sara Gilbert and Lecy Goranson returning. Michael Fishman is expected to be in some of the episodes, according to Deadline. "While not the mega hit of the size of the Roseanne revival, The Conners has been a breakout for ABC," says Deadline's Nellie Andreeva. "In its first season, the Roseanne followup averaged 9.5 million total viewers and a 2.2 adults 18-49 rating (Live+7) to rank as the season’s No. 1 new comedy in total viewers and 18-49 and ABC’s No. 1 comedy in both categories. The Conners improved its Tuesday 8 PM time period by 33% in total viewers and by 22% in adults 18-49, posting 5-year highs for ABC in the half-hour."